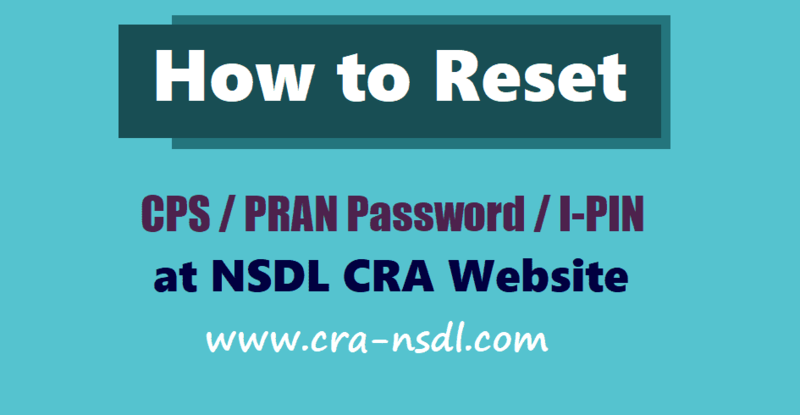 How to Reset CPS/PRAN Password or I-PIN @ NSDL CRA Website: Step by Step process to Reset CPS/PRAN password, How to reset CPS/PRAN Password, How to reset I-PIN. Step 1: If you wish to reset your I-PIN using the secret Question and Answer. Step 2: First , click on the submit button in the Subscribers box and a webpage will be appeared. Step 3: This section for Reset Password using secret question" and "Instant Reset I-PIN"
Step 4: Now please select the “Reset Password using secret question” radio button. Step 5: Enter your 12 digit user id that is your PRAN number and click on the submit button. Step 6: Then enter answer of your secret question in the required field and click on the submit button. Step 7: Enter your new password and confirm new password. If you wish to reset your I-PIN and activate the same through One Time Password (OTP) or through Nodal Office / Point of Presence, please select the option "Instant Reset I-PIN". Step 2: Then an another window will be appeared, there you will see the "Reset Password using secret question" and "Instant Reset I-PIN". Step 4: In this page marked fields are mandatory. Please enter your details exactly as printed on PRAN Card in fields. Step 5: Click on "Generate OTP", if you wish to authorize your request using "One Time Password (OTP)". The OTP will be sent to your registered mobile number. Step 5: Enter the OTP at where required the place, then there will be appeared a message as Successfully completed. Step 7: There, you can enter your PRAN Number and your password that is you have already given and received there. Click on submit button that’s all. If your password has expired. Please change your password. Step 8: In case you have not registered your mobile number at CRA, please click on "Go to Nodal Office" and get the request authorized by Nodal Office / Point of Presence.